BOSTON - Harvard goaltender Lindsay Reed made 52 saves and the Crimson scored four unanswered goals on Tuesday night in the Beanpot Tournament semifinal, topping the No. 7/7 Boston College women's hockey team 4-1 at the Bright-Landry Hockey Center. The Eagles will now face No. 3 Northeastern on Tuesday, Feb. 12 in the Beanpot Consolation game. BC struck with late in the first and Makenna Newkirk's 10th of the season had the Eagles up by one at the first intermission. Harvard, though, would score twice in the final 10 minutes of the second period to put itself up by one at the second intermission. A goal nine seconds into the final regulation frame but Harvard up 3-1 and grabbed another late in the frame. Maddy McArthur finished with 22 saves for BC while Reed stopped 52 for Harvard. The Eagles had a 53-26 edge in shots on goal. Neither BC (0-for-3) or Harvard (0-for-4) converted on the power play. February 5, 2019 | 8 p.m.
1st, 19:18 | 1-0, BC GOAL: Caitrin Lonergan circled behind the Harvard net and around the right circle before sliding a pass to Daryl Watts at the top of the slot. Daryl Watts' one-timer deflected off a defender and Newkirk into the upper right corner of the net. 2nd, 8:10 | 1-1, HARVARD GOAL: Brooke Jovanovich skated down the left wing and used a quick to drag to get herself space for a wrist shot that beat McArthur's glove. 2nd, 6:16 | 1-2, HARVARD GOAL: Kate Glover entered the offensive zone and then worked to her forehand to feed Dominique Petrie for a high wrist shot from the slot. 3rd, :09 | 1-3, HARVARD GOAL: Lexie Laing skated onto a puck and from the right circle slotted a low wrist shot inside the far post. 3rd, 15:47 | 1-4, HARVARD GOAL: McArthur made the initial save on a shot but Jovanovich was able to put the loose puck home from the top of the crease. - BC is now 38-38-2 all-time in the Beanpot and 31-16-2 since becoming a varsity program (1995-present). - The Eagles are now 15-26-1 in the all-time series with the Crimson and 3-15-1 on the road ... BC is now 7-11-0 against Harvard in the Beanpot. - Head coach Katie Crowley is 12-5-1 all-time against Harvard. - Caitrin Lonergan has now registered at least one point in seven straight games. - The Eagles have out-shot the opponent in 17 consecutive games ... this was BC's fifth contest this season with 50-plus shots on goal. - BC's 19 shots on goal in the first period were the most for the Eagles in a Beanpot regulation period since firing 25 against Northeastern on Feb. 9, 2016. - Lindsay Agnew finished with a game-high eight shots n goal ... three other Eagles in Daryl Watts (7), Lonergan (6) and Cayla Barnes (5) finished with 5-plus shots on goal. 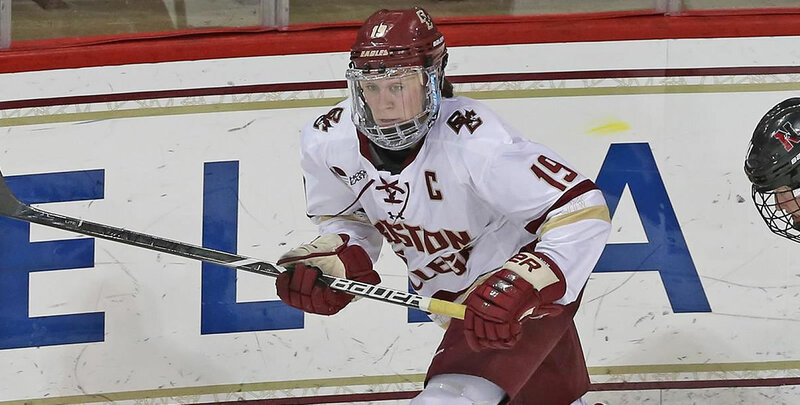 - The Eagles winning streak came to an end at six games ... BC's winning streak against Harvard was stopped at five ... the Beanpot winning streak came to halt at six. Boston College will take host New Hampshire on Friday, Feb. 8 at 6 p.m.